Well the Parminter’s breakfast was certainly unto standard and yet another friendly host. One of the themes running through this holiday from last year to this, has certainly been the different places we have stayed at, but all have had really friendly hosts. We certainly arrived a in Barnstaple hoping for a lovely place to stay from the website it looked very nice, we we’re not disappointed, a large room and an equally large bathroom with a bath as well as a shower, I can tell you a bath is luxury on a holiday like this So far well done the Old Vicarage in Barnstaple a very good place to stay. One of the most interesting parts about this and last years holiday has been the variety of places we have stayed. OK to the walk, well today we started in our coats, we decided to leave the wet legs in the bag, being determined that it was’t going to be that bad, well at times it seemed we were wrong, but we did arrive relatively dry so all in all, although the wettest day since the start of the walk, still a really enjoyable one. The scenery certainly different as other than a few miles to start off with we soon got into the Taw Estuary, something we had not experienced so far. But before we really got into the estuary we walked along the Saunton Sands, now I though that yesterday we had probably walked along the longest beach that we we’re likely to along the SWCP, but oh I was wrong. We left Croyde and headed round the coast and rather than using the ‘official’ SWCP path we decided to walk along Saunton Sands which is 3 miles long, well at least the stretch we did, it does go on longer! We had been told that a number of walkers ‘cheat’ along this stretch by missing out the length to Barnstable and then even to Bideford, but oh not not us, I’m too OCD to miss a section out like that . We really enjoyed the difference in scenery and seeing the countless wading birds as the tide went out was really interesting, oh and remember we didn’t find many shells on Grunta Beach well Saunton came up a treat, now how on earth we’ll get them all home safely is another matter. I must say that from Braunton to Barnstaple did have a stretch behind Chivenor Airport (an RAF and apparently a Royal Marines Base) that was a little tedious, but overall we wouldn’t have missed this stretch. For anyone looking for a useful shop when you get into Braunton there is a Tesco just off the path to the left before you turn and head toward Barnstaple. The weather was mainly drizzle with bursts of rain, but there was enough dry spells to keep our spirits up. We took an ale at the Braunton Inn between Braunton and Barnstaple which was much needed at the time. We ate in the evening at 62 The Bank and can highly recommend it. I had a problem with the GoPro in so much as along Saunton Sands the battery ran out, but I didn’t hear the warning bleep so I don’t know how much of that section I missed, and although I got past the point we’ll be starting from tomorrow, the memory card ran out prior to reaching the accommodation. I suppose 14 miles is a long way on a 32GB card. 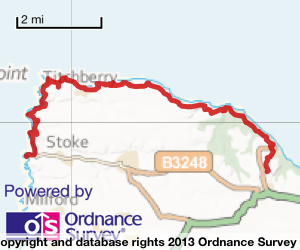 15.6 miles Distance, including extra walks to beaches and to the ends of any points we visited.